Same as I use though I have the package with the timing functions. Once you have fitted a twin-trip meter and a pair of stop-clocks, plus a map light if it will be dark - assume it will be. Have a power socket for the map magnifier and make sure each item is separately fused. Then after a few events you and your navigator may add or change things around to suit yourselves. Thanks for the pointers, I have made a list, major thing we need to sort is a trip meter. The car has some wiring in it for the various additional bits like potti and trip meters, and also has a map light on the cage but i need to sort out the wiring so that i understand it and know its right, in case i need to solve an issue with it at some point, but until the car is MOT’d that can wait. And to MOT we need seats and belts which handily turned up yesterday. 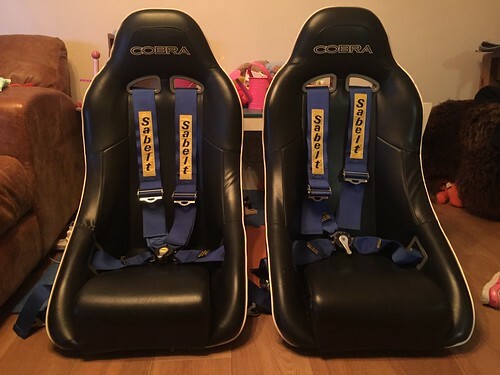 With these here I can get a mounting sorted to fit them to the welded in seat rails with some subframe runners allowing for the seat to be moveable so that both me and the GF can drive without having to unbolt the seats and relocate them into a set of fixings further forward each and everytime. Need to speak to my mate who is an MOT tester to check this out a little. The cone compressor turned up along with the new cones, I was short on time this weekend but had a quick couple hours here and there, first snag was jacking it up onto stands, the thing is so low, it has the Scottish dural sump guard on it. Am I ok to jack up on this, I am assuming so as the entire weight of the car will be resting on it at points when it decks out, which given its current height will be often!! Second snag was that the cone compressor does not want to thread into the cone. I’ve sprayed some plus gas into is and will put some grease onto the compressor to see if that helps but im not holding my breath. Now I thought the car was sat on standard trumpets at the front, and it was sat so low due to the cones having sagged. Turns out it has got Hi-Lo’s fitted to the front but wound pretty much all the way down. Now this causes a couple new problems, I was going to smash the std trumpet to allow me to get the cone out if the compressor would’nt thread into it, then replace the smashed std trumpet with the new Hi-Lo. This now becomes trickier as I am not smashing the Hi-Lo that’s in there!! 1 – I wouldn’t want to & 2 I probably couldn’t even if I did want to. So I could just adjust it up and get the front end to a more appropriate height, but I have bought new cones and the old ones will definitely be past their best so I want to change them out. Can I remove the top arm safely if I wind the hi-lo to its lowest and remove the bump stop to let the hub droop as low as possible? If not what is the best/alternative way to remove the cone if I can’t get the compressor to thread/wind in and now can’t smash the trumpet? Si sent me some links to some regularity training scenarios and also some links where you could download the regularity instructions from prior years of the ToC. After a little bit of reading and understanding I made sense of them ok and have bought the OS maps (will more than likely need some of them for this years event anyway) so will have a go at plotting them on the maps when they land in the post. At the start of the rally how long do you get the instructions for prior to your start time. As working through them was ok sat at my desk with just them to concentrate on, trying to do that in a car whilst trying to keep someone going the right way sounds like a headache!! Edited by 28hodge, 31 October 2017 - 04:41 PM. Don't worry about the starter, it will not be an issue. Do make sue the suspension is raised slightly higher than standard and set the suspension accurately to the figures I have posted elsewhere. For events like the TofC the important things are that the car looks right and is not too noisy. Make sure the electrics all work and that each important electrical component is individually fused. Run twin fuel pumps with separate switches and fuses. Of course you can jack up on the sump shield. If driving aggressively you will, at some time, land on it at around 60+ mph - I know I have lots of times! Don't worry about making it go faster, just go the right way and be super-accurate on the tests. Very important is to make sure the navigator takes anti-sickness pill(s) 1/2 an hour before the rally starts. The biggest issue you will have is the navigation and driving to the required average speed to within a couple of seconds. the top crews tend to drop only single figures of seconds on the regularity, and don't forget that the navigator not only has to keep to the speed by constantly monitoring distance against time, he/she also has to stay on the right route at all times. the top crews make no navigational errors at all. easy it ain't. Get out and practice driving a route at an exact average speed. to keep an average of, say, 27.5 mph for 5.2 miles then change to 29.4 mph whilst keeping on the right roads is where the skill comes. The tests can be a bit complicated and penalties are high for doing a test incorrectly, for hitting cones/markers and for not stopping astride a line when required. Just get the car reliable, go the right way, do the tests accurately and do your best to keep to the required average speeds on the regularity sections. I'll be marshalling on the TofC - see you there! Ok so I have questions!! The cones are rusty and rats, I can't get anything to thread into them, now they may be imperial threads and old, which is why I can't get anything to thread into them. So I could buy some imperial studding and see if that will work and use that in the compressor tool to get them out. However the car has hi-los on it now, if read a couple threads that said if I wind them right down remove the shock and bump stop then I will have enough room to get the hi-lo out and then remove the cone? Seems unlikely to me, anybody heard/done this? Next is the sills. I had a prod about and it'll patch but I've got a nagging thought that I should take the sills off and I kinda want to anyway as they are an over sill. Now the car has had some welding in the recent past 2 years or so as it had a cage and the sand which plates fitted to the floor inner and outer sill. The over sill looks brand new when I take the waxoyl off. So I think it was fitted when the roll cage was and a good cage installer wouldn't fit the cage and plates to rotten weak sills. But I have a nagging thought that I want them off and changed to correct sills. This will let me get into the rear subframe mounts and get them freed up and replace the bolts in them etc and check the inner sill and make it a lot easier to repair it with a patch. But I will have to then re do the tool cage plates etc once the new outer sills are on. The biggest problem is I am writing this from a hospital bed. I broke my leg 18months ago and got a call last week to book me in to remove the metal work so I am going to be laid up for a couple weeks so progress will be pretty slow for a while! A rally car takes a lot of additional dynamic loading. Make sure the entire shell is rust free and strong. A roll cage is only as strong as the structure to which it is mounted. There are inner/outer sill sub-assemblies available from M-Machine for around £70 per side. These include the jacking points. I have used these and they are excellent. On my 'S' I have reinforced the rear sub-frame heelboard mountings by adding tapered gussets inside the sills. I would never rally in a Mini with oversills as I have seen what usually lurks underneath them. If you wind the Hi-Lo's right down, then undo and remove the top arms you will be able to get the old cones out. If the cones have suspect threads it would be unsafe to use a 'tower tool' to compress them. Yeah whilst sat in hospital yesterday I came to the same conclusion with the oversills, I have a 92 Cooper which is a project that came with oversills and I have used and welded in the m machine floor/sill assembly into that. So sill off on one side and see what's there. Then go from there. Like I said it also gives me the chance to have a look at the subframe mount in the heel board and get that free'd off, I might buy another new subframe and then seam weld it up this is going to be an expensive few months!! May be an expensive few months but well worth it. Just don't spoil it on the first event by throwing it at the scenery (like we once did). I do have a mint subframe on my other mini, i may nick that and put it onto this though it is a later type not that it'll matter much. I need to get the car into my garage extension from where it lives which is only over the road 50yrds away, but there is no power in there, I do have a big genny that i use when away racing for the tyre warmers and kettle etc when not in the pit garages, but I don't think my neighbours would appreciate that much, I may make a baffle box for it and see, I'd not want to run my welder from it anyway, though it is big enough to do so. Am i Ok to cut one sill off and then move the car without any bracing? it would be going over gravel and then up a block pavouir ramp into my garage? Although one thing I will say that is important before you start faffing around with rally prep and any goodies like trip meters etc.....get the car MOT'd and reliable before any further modifications are made. To finish first, first you must finish. On there you will find the specs for a Cat 2 mini which is what you are building. Starter will need changing as per what Si has done, and if memory serves me right, Brynmor's (he's a mate of mine) car has a HIF44 single carb on it and that will need changing also. Any questions just shout out as I've competed on the ToC and other HRCR events as both a driver and a nav and i'm also a member of KDMC. Cheers Dave, Have previously read that thread you linked, its saved into my favourites. And yep getting it MOT'd and then using it a bit is the plan. to that end i need to patch the inner sill a little so will remove the existing oversill, free off the subframe mounts whilst i am in there and clean up the inner sill then put back on the correct outer sills. Sounds simple, bet its not!! I had booked some days off this week to start getting all the jobs done, but hospital shelved that when they rang last week to schedule me to have the metalwork out of my Tib/Fib which i broke about 18months ago. That was done Tuesday gone so will have to sit tight for a couple weeks. A set of 1/1/4 SU's came with the car so that's not too much of an issue, will get those fitted then try to find a dyno localish to get them set up. I actually read the entire of your thread again over the last couple weeks to pick up on bits. Really I just wanted a list of the things that we will need prior to doing an event so I can keep an eye out for it in the next few months, I don't want the first time we lay eyes on the trip etc to be the morning of the ToC. Ideally i'd like to do some practising with the car and the trip etc before. I have no intention of being any good at this but I'd at least like to try and make it so that we know what we are supposed to be doing, even if actually doing it is beyond us haha. I don't plan on making any mods to the car other than getting the suspension raised and fresh cones into it. The forms for the rally training landed into my inbox on Tuesday so will get them filled out and sent back. I have sat with some of the previous route instructions from the TOC and the OS map and plotted them and seem to be struggling most with the herringbones. Will have to keep practising. I m hoping i can get a copy of this years Devils Own instructions as thats local to me so we could plot that and have a practice. But not being able to do anything productive at the minute is killing me, it'll be another 10 days till i am able to get on really.